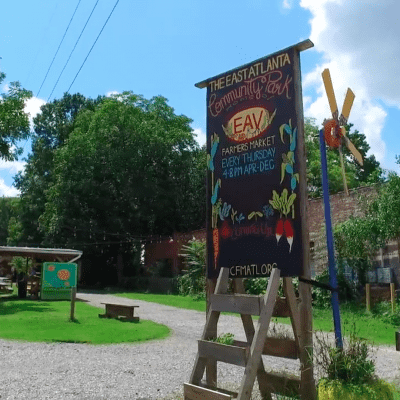 A fun and funky community, East Atlanta Village has something to offer everyone. From the eclectic street art to the hip music venues, you will always find something new to do and see. Located just 4 miles from Downtown and only 2 miles from Old 4th Ward and Grant Park, residents of East Atlanta Village would be hard pressed to find a more centrally located area with more things to do. East Atlanta is one of the best neighborhoods in Atlanta for viewing street art. Works by international artists such as Fefe Talavera can be found as well as works by local artists such as Ray Geier and Shannon Willow. Many of East Atlanta's murals were brought to the neighborhood by Living Walls and the Outerspace Project. Some of East Atlanta's murals are easily visible from the street, but an equal number of murals are tucked away in back parking lots, in alleyways and behind buildings. You may have seen Delia’s Chicken Sausage Stand on numerous TV programs already but you won’t quite believe your eyes until you see chicken sausage, egg, and cheddar cheese served on grilled Krispy Kreme donuts in person. Open 24 hours on the weekends, it is popular destination for anyone out late looking for a hot bite to eat in East Atlanta.